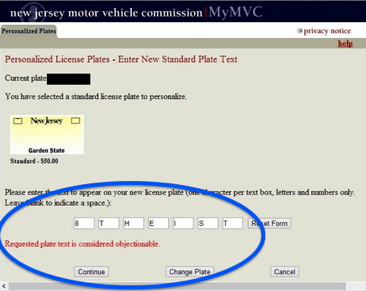 During 2013-NOV, Shannon Morgan of Leesburg, NJ applied online to her state's Motor Vehicle Commission (MVC) for a custom license plate for her car. She asked that it would say "8THEIST." It is not clear why she did not ask for an "ATHEIST" plate which would seem to indicate her message more clearly. Their decision appears to conflict with the guarantees of freedom of religious thought and speech in First Amendment to the U.S. Constitution which are binding on all levels of government: federal, state, and municipal. There is much disagreement over whether Atheism is a religion. Some have suggested the analogy that collecting postage stamps is a hobby, but that not collecting stamps isn't a hobby. Others note that Atheists believe specific thoughts concerning deity, and that when an Atheist or Agnostic is asked what their religion is, they often use these terms in reply. Also, public opinion polls often show results for Atheism in addition to Christian, Muslim, Hinduism. etc. Atheism is thus regarded to be a religion by many people. The word "Trinity" simply implies a belief in the nature of God held by almost all Christians: that a single Godhead includes three persons: God the Father, Jesus the Son, and the Holy Spirit. But many Jews and Muslims, who believe in a single, undivided deity, find the term offensive. The word "Goddess" simply affirms the existence of a female deity as recognized by Wiccans, most Neo-pagans, most polytheists, some feminists, and others. But to most monotheists, only a single deity exists who is commonly referred to as "God," and who is generally considered to be male. Yet, because the label on a personalized license plate is a form of speech, it is protected under the U.S. Constitution. The Constitution does not guarantee that nobody will ever be offended by another person's speech. It merely guarantees that every person has freedom of speech on religious and other matters, even if others find those beliefs blasphemous, evil, disturbing, or ridiculous. Having received a denial from the Motor Vehicle Commission, Ms. Morgan then applied for a different license plate: one which would say "BAPTIST." This was approved. Clearly, the Commission was judging which religious beliefs are legitimate and worthy of protection, and which are not. This would appear to be a violation of the First Amendment to the federal Constitution's implied wall of separation of religion and government -- often referred to as "separation of church and state." The phrase originated in a letter from Thomas Jefferson to the Danbury Baptist Association of Connecticut in 1801. The "wall" has been subsequently recognized by the U.S. Supreme Court in multiple rulings. The agency attempted to resolve the matter with the Commission, and were also unsuccessful. The result was a lawsuit, Morgan v. Martinez, filed by Americans United during March or April, 2014 (sources differ) in the Trenton, N. J. Federal District Court. The defendant was Raymond Martinez, the Chair and Chief Administrator of the New Jersey Motor Vehicle Commission (MVC). Ms. Morgan noted that David Silverman, president of American Atheists and a resident of New Jersey, had applied in 2013 for a personalized New Jersey license plate that read 'ATHE1ST'" with a number '1' replacing the letter 'I'. He received an email in response from the commission saying that his application "must be denied" on the grounds that his application was either "Objectionable or Need for Further Clarification." When he followed up with a phone call, he was told that his requested plate wording was "offensive." He then wrote a letter to the Commission asking again for the ATHE1ST plate. "... has a practice of denying personalized license plates that identify vehicle owners as atheist, thereby discriminating against atheist viewpoints and expressing a preference for theism over nontheism. ... Although the commission eventually relented and granted Mr. Silverman his requested license plate, it refuses to allow Ms. Morgan’s requested plate. ..."
"... establishing and maintaining a custom and policy of denying and disfavoring license plates that send a message that is supportive of an atheist viewpoint. "After the Commission's denial of Mr. Silverman's application began to attract public attention and a reporter from the International Business Times questioned the Commission about it, the Commission relented and told the reporter, and later Mr. Silverman, that it would reverse its decision and issue the 'ATHE1ST' plate." However, she notes that the Commission still has not amended or appealed its regulation that continues to grant it the right to prohibit plates that it regards as "offensive." Judge Wolfson issued her ruling on 2015-MAY-12. She determined that Ms. Morgan has standing to bring her complaint to court. She subsequently ordered the MVC to supply Ms. Morgan with her "8THEIST" license plate within 60 days after she pays for it. In addition, she barred the state from denying other custom plates in the future that involve themes such as non-belief, rights for the LGBT community, or feminism. The case received minimal exposure among religious web sites on the Internet.